Copyright RIEGL Laser Measurement Systems GmbH © 2018– All rights reserved. RIEGL has been producing LiDAR systems commercially for 40 years and focuses on pulsed time-of-flight laser radar technology in multiple wavelengths. RIEGL’s core ”smart waveform” technologies provide pure digital LiDAR signal processing, unique methodologies for resolving range ambiguities, multiple targets per laser shots, optimum distribution of measurements, calibrated amplitudes and reflectance estimates, as well as the seamless integration and calibration of systems. RIEGL’s various 3D scanners offer a wide array of performance characteristics and serve as a platform for continuing ”Innovation in 3D” for the laser scanning industry. From consultation and quotation to integration of the system, as well as training and support, RIEGL maintains an out-standing history of reliability and support to their customers. The RIEGL staff comprises more than 200 highly skilled and motivated engineers, technicians, and other qualified employees. Copyright RIEGL Laser Measurement Systems GmbH © 2018– All rights reserved. Copyright RIEGL Laser Measurement Systems GmbH ÂŠ 2018â&#x20AC;&#x201C; All rights reserved. 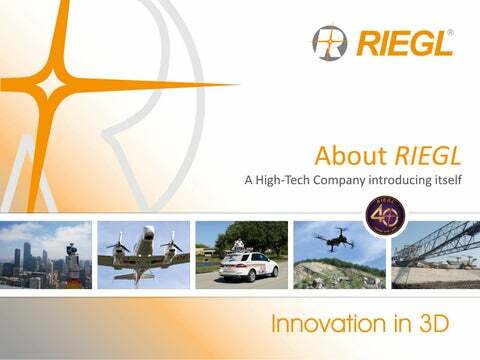 The RIEGL headquarters provides more than 40,000 square feet work space for research, development, production as well as for marketing, sales, training and administration. Another 350,000 square feet of open-air ground is used for product testing. In October 2018, the ground-breaking ceremony for an additional manufacturing building in Horn, which will almost double the currently available operating space, will take place. Every RIEGL Laser Scanner has to meet or exceed the requirements of the European Standard EN 61326-1:2013 concerning electrical equipment for measurement, control and laboratory use and is therefore especially tested. RIEGL scanners‘ measuring capability is verified here. Before delivery every RIEGL terrestrial laser scanner has to stand the proof at the calibration field to review geometric adjustment, compass alignment, internal calibration, etc. For verification of RIEGL’s UAV LiDAR sensors‘ or RiCOPTERs‘ performance - but also for demo flights - special airfields in Horn and Styria are available. calibration field Copyright RIEGL Laser Measurement Systems GmbH © 2018– All rights reserved. Terrestrial Laser Scanning RIEGL's Terrestrial (Static) Laser Scanners are exceptionally compact and fully portable instruments providing detailed and highly accurate 3D data rapidly and efficiently. RIEGL’s unique Waveform-LiDAR technology – based on echo digitization, online waveform processing, and multiple-time-around processing – is the key for high speed data acquisition. A new processing architecture of the VZ-i Series enables execution of different background tasks (such as point cloud registration, georeferencing, etc.) 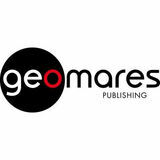 on-board in parallel to the acquisition of scan data. Applications of RIEGL terrestrial laser scanners are wide ranging, including topography, as-built surveying, mining, architecture, archaeology, cultural heritage documentation, monitoring, civil engineering and city modeling. RIEGL VZ-400i / VZ-2000i • up to 1.2 million meas./sec • range up to 800 / 2,500 m • accuracy / precision: 5 / 3 mm Copyright RIEGL Laser Measurement Systems GmbH © 2018– All rights reserved. Airborne Laser Scanning Airborne (Kinematic) Laser Scanning is a rapid, highly accurate and efficient method of capturing 3D data of large areas, such as agricultural or forestry sites, urban areas, industrial plants, power line or rail-way corridors, etc. RIEGL offers various ingenious solutions optimally tailored to the missions‘ requirements – from single laser scanner engines to fully integrated laser scanning systems and welldeveloped turn-key solutions. NEW RIEGL VQ-480 II / VQ-580 II Airborne Laser Scanning System at 1550nm / 1064 nm wavelength • compact & lightweight design: ready for integration in helicopters, small aircrafts, or UAVs with higher payload capacity • high accuracy ranging based on RIEGL Waveform-LiDAR technology • wide filed of view of 75° • pulse repetition rate of up to 2MHz, measurement rate up to 1,250,000 meas./sec • perfectly linear and parallel scan lines • interfaces for up to 5 optional cameras • mechanical and electrical interface for IMU/GNSS integration • removeable data storage card CFast® and integrated Solid State Disk (SSD) • compatible with stabilized platforms and even small hatches RIEGL VQ-480II scan data Copyright RIEGL Laser Measurement Systems GmbH © 2018– All rights reserved. enhanced target characterization by simultaneous measurements at green and infrared laser wavelengths Copyright RIEGL Laser Measurement Systems GmbH © 2018– All rights reserved. Mobile Laser Scanning Mobile (Kinematic) Laser Scanning enables rapid and efficient data acquisition from a variety of moving platforms, such as cars, railway vehicles, ships, boats, etc. Unmanned Laser Scanning Laser scanning utilizing high-end unmanned airborne platforms provides the possibility to acquire data in dangerous and / or hard-to-reach areas, while offering an excellent cost-to-benefit-ratio for numerous applications, e.g. precision farming, forestry and mining. RIEGL VUX-SYS for RiCOPTER Copyright RIEGL Laser Measurement Systems GmbH © 2018– All rights reserved. BathyCopter • RiCOPTER equipped with Bathymetric Depth Finder RIEGL BDF-1 (comprising of tilt compensator, an IMU/GNSS unit with antenna, a control unit and up to two external digital cameras) providing up to 1.5 Secchi depth measuring range • ideally suited for generating profiles of inland water bodies • floating support for safe water landing and take-off from water bodies • excellent performance even at adverse conditions based on pre-detection averaging • highly accurate, reliable and informative bathymetric data resulting from RIEGL’s proprietary hydrographic waveform processing Distributed, supported and serviced by BathyCopter: RiCOPTER with fully integrated RIEGL BDF-1 and floating support Copyright RIEGL Laser Measurement Systems GmbH © 2018– All rights reserved. Industrial Laser Scanning RIEGL offers powerful scanners and scanning solutions for various fields of industrial applications. All these are exceptionally compact, reliable, and provide highest performance and longevity even in harsh and demanding environments. Explore your project and extract plots in your browser! Copyright RIEGL Laser Measurement Systems GmbH © 2018– All rights reserved. Use of this presentation other than for personal purposes requires RIEGL’s written consent. Copyright RIEGL Laseris Measurement Systems GmbH © 2018– reserved. The presentation compiled with care. However, errors cannotAll berights fully excluded and alternations might be necessary.